Patients can easily feel lonely during infusion therapy or a hospital stay. Healthcare organizations can help ease this by providing technology that not only makes patients feel more comfortable, but also connects them to their friends, family, and entertainment or distractions they prefer. Many facilities staff choose to install wall-mounted televisions that use a pillow speaker control, but those can feel impersonal. The other option, equal to a 90” wall TV experience, is to provide some form of personal tablet experience. Tablet options are typically either hospital-owned consumer-grade tablets or personal UL-Listed healthcare-grade arm-mounted TV-tablet touchscreen displays. Tablets can provide infotainment, telehealth capabilities, translation services, and social connectivity through social media, email and more. While some consumer-grade and healthcare-grade tablets can offer these benefits, let’s see how they match up on some critical requirements for performance in healthcare environments. Healthcare-grade TV-tablets are designed for infection control and withstand repeated cleanings with the strong chemicals that facility housekeeping staff use to sanitize patient rooms. Healthcare-grade TV-tablets are designed with antimicrobial plastic coatings and an easy-to-clean glass front. This helps limit hospital-acquired infections for patients who engage with the bedside devices. It can also contribute toward a positive impact on facility reimbursements from Medicare. Consumer-grade tablets are not designed with infection control in mind, as they are often only used by a single person. They can be damaged during disinfection and consumer warranties may not apply for commercial use. Adding sturdy, cleanable cases could make the consumer devices heavier for the patients, which could lead to fatigue or annoyance. Few options exist to securely mount a consumer-grade tablet. Often, a patient will need to hold the tablet device, which can lead to soreness in the neck from looking down. Mobile tablets are easily thrown out with the bed sheets, dropped, damaged or even stolen. Having a constant need to replace lost or broken tablets can be a cumbersome expense to consider for any healthcare facility. Healthcare-grade TV-tablets are securely mounted on swing-arm solutions that can be adjusted to conveniently match the patient’s position, providing extra comfort. A variety of mounts exist to satisfy patients of all ages from infants in a crib, to those patients in bed or seated in chairs, or even patients required to lie flat in bed. While patients are asleep, arm-mounted devices can also swing around to provide entertainment for visitors in the room, with less noise or light distractions to patients as they heal. Because they are mounted securely, there is a lesser risk of damage or theft to the devices. Have you ever lost your phone or tablet charger? With consumer-grade tablets, this is a very practical concern. These tablets are battery powered, not continuously charged, so facilities need to have docking charger stations in place, as well as device-rotation plans. Some facilities even incur the expense of hiring additional staff to manage the security on integrated consumer devices. Consumer-grade tablet batteries are designed to operate around 6 hours per day, which is much less than they will be used in a healthcare facility setting. UL-Listed healthcare-grade TV-tablets are continuously powered over coax through the arm mount to a low-voltage power supply, and power over Ethernet designs are expected this year. These devices are designed and tested for heavy use in the healthcare facility. They offer higher reliability components designed to withstand 18 hours of use per day - three times that of the consumer-grade tablet. This eliminates the need for a separate charging bay, and patients continually have access to the device if they want to use it. Healthcare-grade TV-tablets are low-voltage and designed with safety in mind, protecting both patient and facility, while consumer-grade tablets are not. Low-voltage systems meet the stringent requirements of UL60065 and reduce the risk of shock to patients or fires within a facility. Healthcare-grade devices offer a much larger viewing area, up to 2.5 times the size of the consumer-grade screen. A 19” arm-mounted device is equal to a 90” wall TV experience. Healthcare-grade devices are compatible with leading patient engagement software, and offer key software features to protect personal information including auto-wipe data on-demand. Choosing the right technology for any given facility or patient population is an important task. It can provide privacy, entertainment, and socialization for patients. When deciding between consumer-grade or healthcare-grade tablets, it’s important to learn about the benefits and risks of each. Trust PDi, focused only on healthcare. 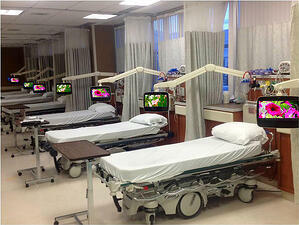 Since 1980, PDi is the largest patient TV manufacturer in the United States. Today, PDi offers proven arm-mounted TV and TV-tablet patient systems from 14” thru 19”. 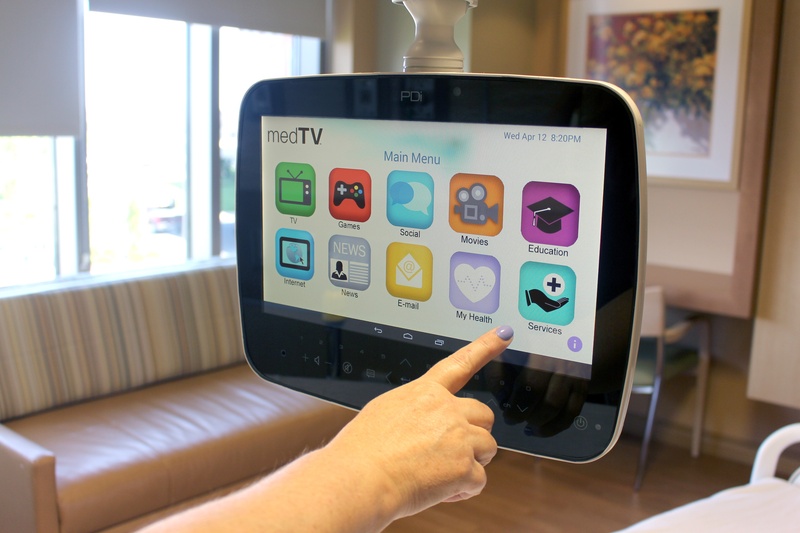 For more information on healthcare-grade TV-tablets designed and assembled in the USA, please visit https://www.pdiarm.com/arm-mounted-personal-healthcare-televisions. Learn more about all PDi products that can help you improve your patient experience. Professional Content Crafter. Helping make healthcare a more enjoyable experience.